As Sakura Kinomoto browsed through her father's library, an old book that caught her eye. The book's cover read, "The Clow." Without a thought, Sakura opened it, and her world changed forever. With the aid of the magical Creature of the Seal from the book, "Kerberos," Sakura was proclaimed as the "Cardcaptor." Her mission -- to find the "Clow Cards" and return them to the book that they came from before disaster strikes upon the world. It sounded pretty simple, Sakura thought, but truly was far from it. As Kerberos (or rather "Kero" as he is nicknamed) said, "...The cards do as they please, and nothing can defeat them." "Clow Reed" created a book to conceal the magical cards - the very book Sakura opened with the magical touch, making her the inevitable "chosen one." Now Sakura seeks to collect the Clow and do as her fate has now decided for her. With the help of her best friend, Tomoyo Daidouji, Sakura takes on action not only with high spirits, but with... a keen fashion sense?! Indeed, she does! Tomoyo loves designing costumes for the cute captor, always making them festive with the seasons. Not only does Tomoyo make Sakura's gear, but also video tapes every event for fun, as well as for record. Tomoyo and Kero are the only ones who know of Sakura's other identity. Nevertheless, the nutty array of characters featured within this marvelous story all play important parts, no matter how small. 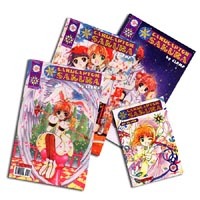 As for Tokyopop's reproduction of the Cardcaptor Series, both novels and comic versions are worth purchasing. If you're like me and long for that stunning cover-art featured in artbooks, you'd probably want to get the comic. If you're more into longer story shots, then novels are definitely your thing. As for the comic content itself, the type layouts and storyline adaptation work nicely with the original artwork, proving for a very nice production outcome. All and all, I feel any otaku would find this particular manga adaptation pleasing - both to the mind and eye.